Fortis Energy Services recently spent an afternoon passing out gifts and getting to know active and retired service men and women at Detroit Metro Airport’s Freedom Center, a lounge dedicated to providing active and retired service men and women and their families a special place to relax while they wait for their flights. While every day we appreciate the work our service men and women do to protect us and our country, it’s especially important around the holidays to show them just how much., said Fortis CEO Nathan Conway. “While every day we appreciate the work our service men and women do to protect us and our country, it’s especially important around the holidays to show them just how much.” said Fortis CEO Nathan Conway. 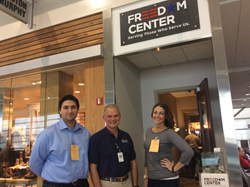 The Freedom Center is a unique, privately funded hospitality center for members of the Armed Forces traveling through Detroit Metro Airport. Among the many amenities the Freedom Center provides free food and drink, Wi-Fi, and various travel amenities to those passing through. Fortis Energy Services, Inc. is a leading oil and gas well service company in the USA. Fortis provides oil and gas well services throughout the production life cycle and operates a premium fleet of service rigs and ancillary equipment to support completion, maintenance and repair operations. All aspects of the enterprise are focused on delivering operational excellence that is safe, reliable and cost effective.